Ihr kriegt nicht genug von Powerwolf und ihren (un)heiligen Metal-Messen - und der Band geht es genauso! Erlebt die Wölfe auch 2019 live und in voller Farbe! Important information: Owners of VIP will be greeted by Powerwolfs tour manager at the main entrance of the specific venue. Please make sure to be there one hour and a half before doors open. Dont forget to bring your VIP ticket AND the regular concert ticket. This package does NOT include a ticket to the show. You must also have a ticket to the show in order to purchase this package. If you dont already ordered a ticket, you can order it here. 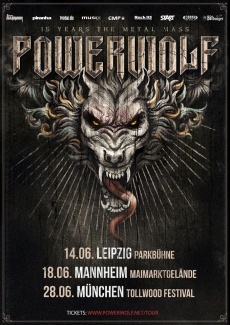 Register now your email address and never miss events, dates and news for POWERWOLF. With their album ‚Preachers Of The Night‘ Powerwolf achieved what nearly no metal band has ever achieved: The wolves entered position number one of the German album charts! No other upcoming Heavy Metal band has accomplished similar sucess in the last years. With album number six, ‚Blessed & Possessed‘, which was released 2015, Powerwolf unstoppably dashed into the top 3 again. Their musical style is not the only aspect that makes them truly unique. Since the beginning the band presented a strong contentual and visual concept that perfectly enframed their music. This includes the lyrics, which are spiked with puns, continues with the strikingly designed artworks und wont end with their lavish and opulently equipped stageshows, which also include fitting requisites and the somber look of all band members. Powerwolf do not only impress on albums/DVD, but also on stage where they prove to be true masters of entertainment who will celebrate a great Metal party with their fans at every gig. Powerwolf do not only rely on their fantastic songs, they also detain a Metal mass und playfully include religious/spiritual elements. The lightshow and the set decoration in sacral designs provide for the proper solemn atmosphere. And the band will surely not let their followers make their way home without being sanctified by front-priest Attila. Powerwolf just combine all aspects to a thrilling event that will give you goosebumps and earned the band the reputation as one of the best live acts out there. 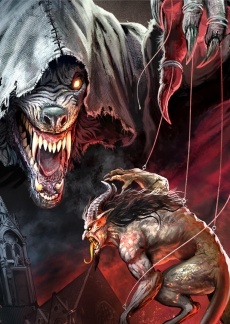 Live on stage, the Wolf will get everyone on their side! The band has already proven this on all big European festivals such as Wacken, Hellfest, Graspop, Masters Of Rock, Greenfield, Summer Breeze, etc. and on their – mostly sold out - headlining tours through Europe. Powerwolf will release a new studio album in summer 2018.